Description: From the upper peninsula of Michigan, this picture was taken last January 2017. I was taking a picture of the deicing helicopter as it was flying over. When I looked at this photo I noticed the object above it. I did not see this as I was taking it. There was nothing else flying other than the two helicopters and the small plane. Do you have any idea? Response to Investigator Questions: The photo was taken in Foster City, Michigan. It is about 30 miles from Iron Mountain, Michigan. I’m not sure of the exact day, but it was January, 2017 between 9:30 and 10:00 in the morning. That was a military helicopter that was trying out their deicing on a plane. They had done this like 3 times, but in different areas of Foster City. I had taken pictures of them before. This is the first time anything else showed up on the picture. This is not the first time anything like this has been seen before in the upper peninsula of Michigan. I was just lucky enough to have a camera in my hand. Thank you for responding. Note: Per conversation with the witness it was determined from the filename that the photo was taken on March 16, 2018. 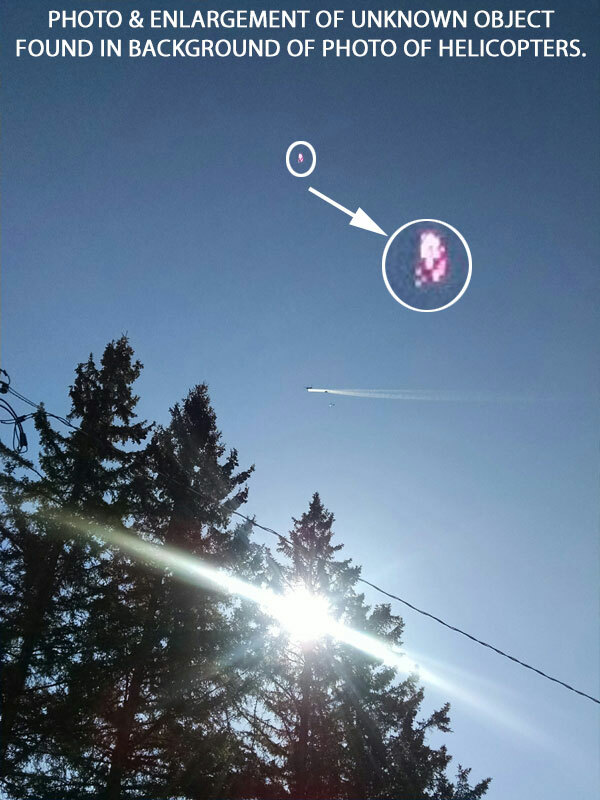 This entry was posted in Discovered anomaly in photo, glowing red, Photos, Strange Shaped, UFO Sightings 2018, UFO Sightings Michigan, Unidentified. Bookmark the permalink. One Response to Strange Shaped Fiery Object Found in Photo of Helicopters. It looks like a balloon of some sort to me.